Many people know that many years ago, Ford made cars composed of hemp, which was great, but sadly, it didn’t make it to today’s market. Ford took it a step further and also fermented plant matter such as hemp to create ethanol for fuel, instead of gasoline, as a cleaner, abundant fuel source. However, petroleum lobbyists won the day, which is why you don’t really see plants powering our cars. So, what about today? 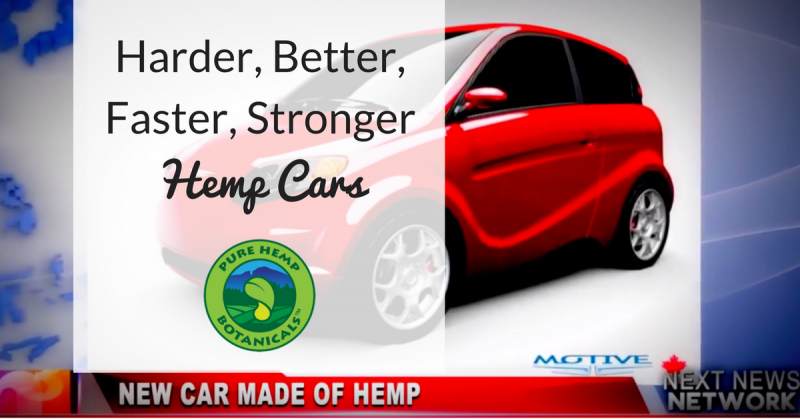 We decided to take a look at the progress of hemp cars. In our search, we turned to Canada. They have a vehicle worth talking about! The Kestrel is being touted as one of the most eco-friendly cars out there. It can run at about 60mph, for 100 miles before needing a recharge. But, can hemp cars stand up to the strength of steel? Absolutely. In fact, they eclipse it. “Hemp composite is as strong as the fiberglass in boats, yet incredibly lightweight” says Angie Ress, of Canada’s Next News Network. She points out that the strength of hemp-based materials is impressive, while the lighter weight makes these cars more efficient than the heavier steel-based cars. The 3-door hatchback weighs about 2400 lbs., which is 1200 lbs. less than the Ford Fusion, which is close in size. These cars don’t need high heat or toxic chemicals to shape it, and in accidents, the pieces easily pop back into shape. Eco friendly, efficient and practical. What’s not to love? Want to know more? Watch the video for the full story!